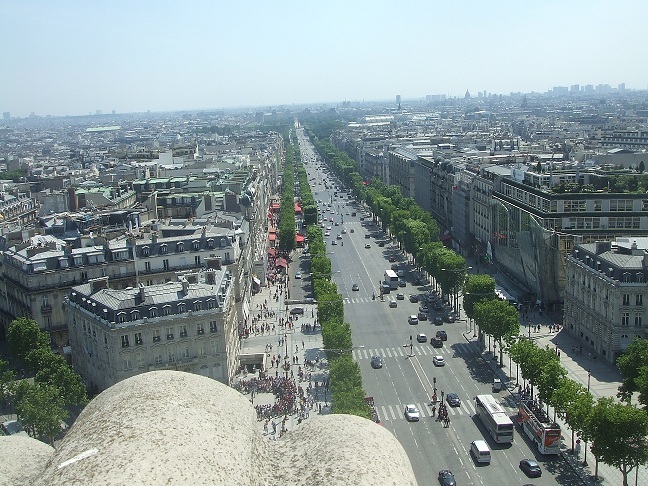 When someone mentions shopping in Paris, you expect them to mention the Avenue Des Champs Elysees (photo above). I ended up there three days into my trip to buy—of all things—Nike walking shoes. I’d bought a pair of Merrell zipper canvas shoes for the trip, which my feet liked, but my back hated. The shoes offered no support for walking on the hard Paris sidewalks from early morning to almost midnight every day. Our hotel concierge recommended the Nike store on Champs Elysees, so off we went. The Nike shoes were a lifesaver, but I must say I wasn’t impressed by the Champs Elysees. In my mind, it was the French equivalent of New York’s Fifth Avenue, where I’d shopped on all my life. It had all the same stores and was jammed with tourists. I put on my Nike shoes and high-tailed away from the Champs Elysees. 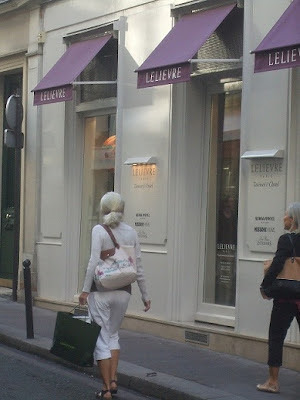 Instead, I preferred the experience of poking in and out of the Paris boutiques. I’m sure there are lots of great shopping areas in Paris, but on my trip, I enjoyed the 4th arrondissement on the Right Bank. This is the medieval district of Le Marais (the closest Metro stop is Hotel De Ville) and actually contains parts of Île de la Cité (including Notre-Dame de Paris) as well as the Île Saint-Louis. I loved exploring the narrow streets with their old buildings and lively cafés. 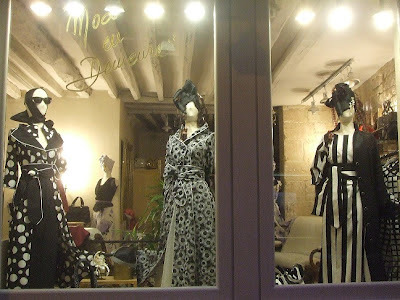 While there are boutiques on every street, the Rue Des Francs Bourgeois (between Rue Vielle and Rue De Turenne) has a nice concentration of shops—lovely women’s fashions that aren’t insanely expensive. I had no idea what size I was in European sizing, but the saleswoman knew my size just by giving me a “once over.” I suspect she's used to guessing the sizes of tourists. 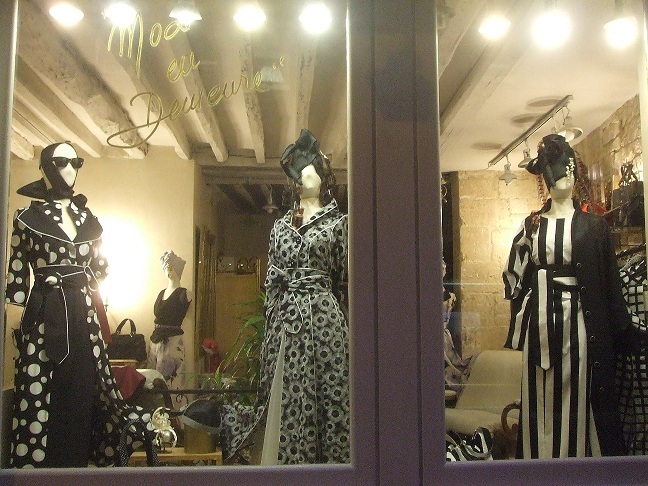 By the by, if you're shopping on the Rue Des Francs Bourgeois, you might want to stop in Musée Carnavale. This is a small museum devoted to the history of Paris and admission is free. We went there because there was a huge Atget exhibit at the time. However, I enjoyed the permanent exhibit and the center courtyard with its hedge garden (photo above). The Musée Picasso is also nearby. If you want to take a break from shopping, there’s the Place Des Vosges (above) just off Rue Des Francs Bourgeois. It's a lovely park for resting and people watching. Unless, of course, you prefer to regroup over a glass of wine and a cheese platter at a café. Another area with a high concentration of women’s clothing stores is Boulevard Saint Germain (pictured above) on the Left Bank. Every designer in the universe (or so it seems) has a store either on the boulevard or one of the side streets. This is high-end shopping, which is out of reach for me. But I enjoyed window shopping, seeing what the “other half” wears. Perhaps, because the shops are sprinkled around the neighborhood, it didn’t seem as jammed with tourist as the Champs Elysees—at least when I was there. 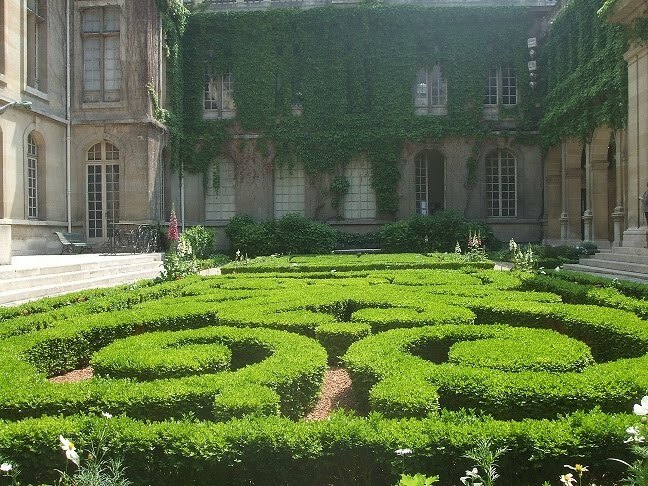 This neighborhood is very close to Saint Sulpice and the Luxembourg Gardens. 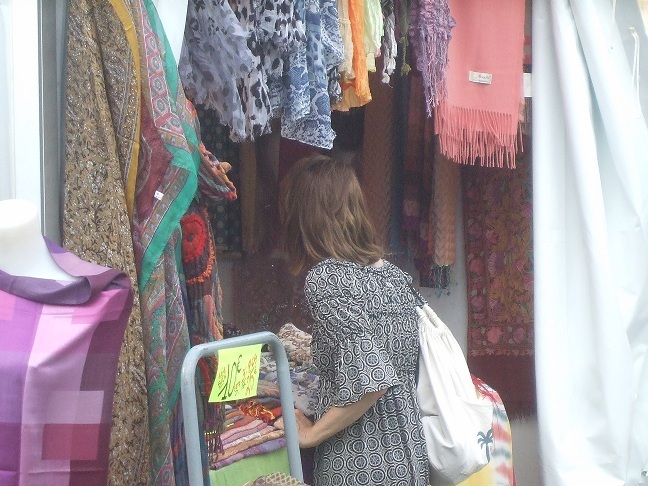 On the weekends, there are plenty of shopping opportunities at the open-air markets all over the city. 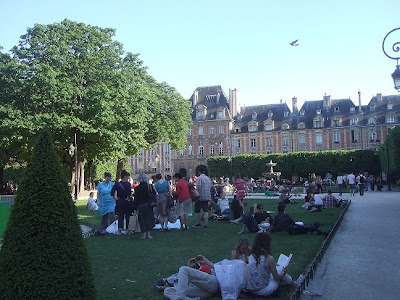 Some of them, like the famous Les Puces de Saint-Ouen, attract massive numbers of tourists. For my first Paris trip, I chose not to include Les Puces on the agenda. Instead, I just drifted into a few as they came up, like an artisan market near the Musée du Louvre (photo above). These little markets were pretty uniform, stocked with jewelry, soaps, scarves, and other inexpensive items. I bought a few souvenirs for work colleagues. Note: the scarves at these little markets were all from China and India and dirt cheap, the same ones you'll find on the street and in the markets in NYC. A couple of months ago, my Flattering50 Giveaway query was: “What Would You Pack for Paris?” I got lots of great ideas from Flattering50 readers, but one piece of advice stuck in my mind as I strolled the Paris streets. A reader had suggested I go to Paris with an empty suitcase and buy all new clothes. Unfortunately, I didn’t have time to a build a shopping spree fund and only bought a few things. I won’t make that mistake again! I’ve already started a shopping spree fund for my next trip! Yikes! Jones Stripes Are 60 Off!